Ecteninion lunensis is an extinct relative of mammals that was discovered in late Triassic sediments in the San Juan province of Argentina. Also found in these same beds, and featured on this site, are the world's oldest-known dinosaurs, Eoraptor and Herrerasaurus. This is the holotype and only known specimen of Ecteninion. This specimen was first described in 1996, but like many fossils, only part of the skeleton was found and the skull is incomplete. Researchers have been able to establish that Ecteninion is an early, basal member of Eucynodontia, a lineage that includes mammals and their closest extinct relatives. However, its exact position among the early eucynodonts remains unclear. 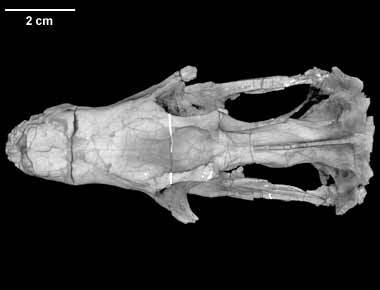 By CT scanning the skull, new information has emerged that may help us to more precisely pinpoint Ecteninion's position on the eucynodont family tree. This, in turn, will help to produce a more refined understanding of the evolutionary events leading up to the origin of mammals. Ecteninion was discovered in 1988 during a joint Argentine-American expedition to the arid badlands of the Valley de la Luna in Ischigualasto Provincial Park. It is one of several important species of extinct eucynodonts that were discovered during this expedition, and it is reportedly the first relatively complete skull of a carnivorous cynodont from South America. Other eucynodonts (including both carnivorous and herbivorous forms) known from the Triassic of Argentina and featured on this site include Probainognathus, Probelesodon, and Exaeretodon. This specimen was made available to the University of Texas High-Resolution X-ray CT Facility for scanning by Dr. Oscar Alcober of the Museo de Ciencias Naturales, San Juan, Argentina and Dr. William Sill of the Universidad Nacional de San Juan, Argentina. Funding for scanning was provided by a National Science Foundation Digital Libraries Initiative grant to Dr. Timothy Rowe of The University of Texas at Austin. The specimen was scanned by Matthew Colbert and Richard Ketcham on 19 January 2000 along the coronal axis for a total of 621 slices, each slice 0.1624 mm thick, with an interslice spacing of 0.1624 mm. Kemp, T. S. 1982. Mammal-like Reptiles and the Origin of Mammals. Academic Press, London. Gauthier, J., A. G. Kluge, and T. Rowe. 1988. Amniote phylogeny and the importance of fossils. Cladistics 4:105-209. Martinez, R. N., C. L. May, and C. A. Forster. 1996. A new carnivorous cynodont from the Ichigualasto Formation (Late Triassic, Argentina), with comments on eucynodont phylogeny. Journal of Vertebrate Paleontology 16:271-284. Rogers, R. R., C. C. Swisher III, P. C. Sereno, A. M. Monetta, C. A. Forster, and R. N. Martinez. 1993. The Ischigualasto tetrapod assemblage (Late Triassic, Argentina) and 40Ar/39Ar dating of dinosaur origins. Science 260:794-797. Rowe, T. 1988. Definition, diagnosis and origin of Mammalia. Journal of Vertebrate Paleontology 8:241-264. Rowe, T. 1993. Phylogenetic systematics and the early history of mammals; pp. 129-145 in F. S. Szalay, M. J. Novacek, and M. C. McKenna (eds. ), Mammalian Phylogeny. Springer-Verlag, New York. Rowe, T., W. Carlson, and W. Bottorff. 1995. Thrinaxodon: Digital Atlas of the Skull. CD-ROM (Second Edition, for Windows and Macintosh platforms), University of Texas Press, 547 megabytes. To cite this page: Dr. Timothy Rowe, Dr. William Sill, Universidad Nacional de San Juan, 2001, "Ecteninion lunensis" (On-line), Digital Morphology. Accessed April 19, 2019 at http://digimorph.org/specimens/Ecteninion_lunensis/.